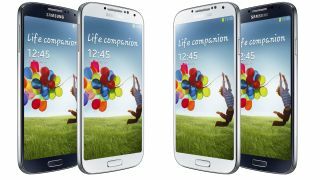 Samsung's rapid ascent to the top of the smartphone tree may be in danger of stalling, amid reports that demand for the flagship Galaxy S4 handset isn't up there with its predecessor. The Korean company's stock price fell by 6 per cent on Friday seeing an estimated $12 billion (about UK£7.7 billion, AU$12.6 billion) wiped off its value, following claims that S4 sales are slowing following an initial surge. What hasn't helped matters is the feeling among bean counters that the launch of spin-off handsets like the Galaxy S4 Mini and Galaxy S4 Active may hurt the company's profit margins. Analysts believe that Samsung is swapping profit for volume by flooding the market with cheaper versions of its flagship device in order to take on affordable handsets from Chinese firms like ZTE and Huawei. Speaking to Reuters, analyst Kim Young-chan, of Shinhan Investment Corp, said Samsung needs to be careful when targeting the middle of the market. He said: "Sales of high-end handsets are lagging behind expectations, while low- to mid-end handsets are selling briskly worldwide. "As the portion of low- to mid-range handsets is expected to increase in Samsung's overall mobile phone business, this has also sparked concerns about thinning margins and lower growth." Samsung, of course, isn't the only company that may be experiencing a slight comedown following a period of insane growth in mobile. Back in April, Apple reported that its profits had slowed for the first quarter in almost a decade, despite selling a whopping 37.4 million iPhones and 19.5 million iPads. The markets panicked about that too, eventually sending Apple's stock price down by almost half from its all-time high of September 2012. That leaves the question: If Apple and Samsung are struggling to appease the financial gods with record sales figures, what hopes do the likes of BlackBerry, HTC and Nokia have of bouncing back?